No. 2 diesel was going to get more expensive, and tougher to find, in the not so distant future. At the 10,000 hour inspection the cylinders showed virtually zero wear, the rings were clean and free. Lubrication in these engines is provided by Gulf Marine engine oils. and sodium up to 40 ppm. All that's basically an involved way of saying these engines can save us a lot of money on fuel." Between the two engines, we looked into eight cylinder heads and piston assemblies. The piston skirts were clean and smooth with zero wear. Cylinder liner wear was mea- sured at 'nil' except for two liners which indicated one- tenth of a millimeter wear, well within acceptable bound- aries. The piston rings were clean and free; maximum ring wear was two-tenths of a mil- limeter. We opened four main bearings and found them in excellent condition. That's a remarkable inspection for engines running this kind of fuel, and I think it's directly attributable to the Gulf lubricant." 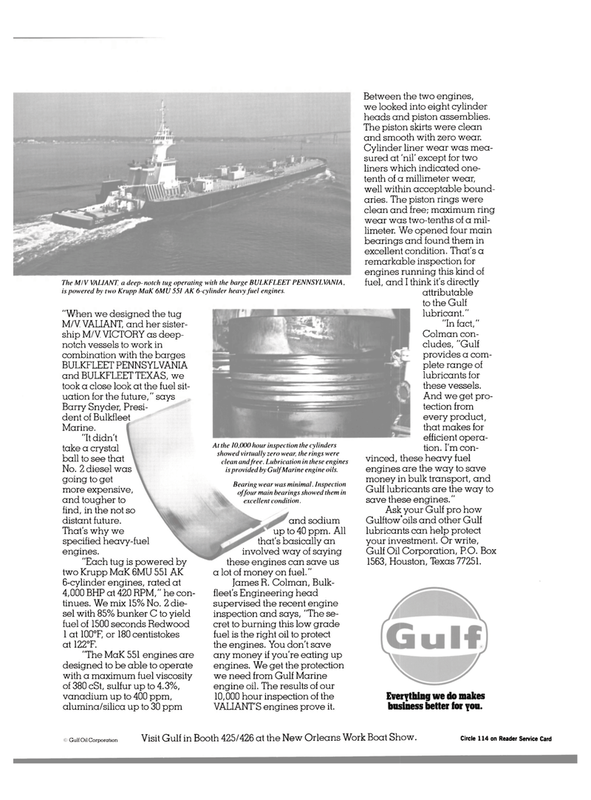 "In fact,"
Colman con- cludes, "Gulf provides a com- plete range of lubricants for these vessels. Gulf lubricants are the way to save these engines." Gulf Oil Corporation, P.O. Box 1563, Houston, Texas 77251. Everything we do makes business better for you. Bearing wear was minimal. Inspection of four main bearings showed them in excellent condition.